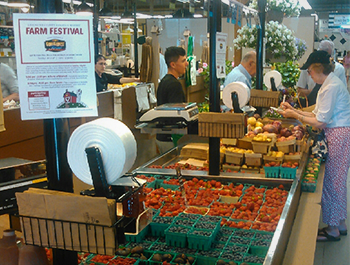 Nowhere is our commitment to providing the highest quality, fresh fruit and vegetables more apparent or important than at our newly renovated Farm Stand in the Lancaster County Farmer's Market. We offer a wide range of farm-fresh produce grown exclusively at our Strasburg, PA farm and greenhouses, as well as a variety of other fresh fruits and vegetables. Plus, we carry an assortment of delicious jellies and other canned goods. 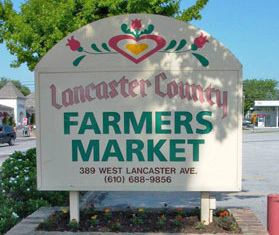 The Lancaster County Farmer's Market is a converted grocery store now filled with small stands selling everything from fresh produce to soft pretzels and fresh meat. It combines modern conveniences such as air conditioning with some of the old-time qualities of a farmer's market. There's just something special about getting to know the people who supply your food. You'll also find a variety of non-edible products for sale, such as jewelry, fresh flowers, and lovely French tablecloths and place settings. Don't forget to bring your appetite because there are a number of delicious, freshly prepared meals to tempt you as well.